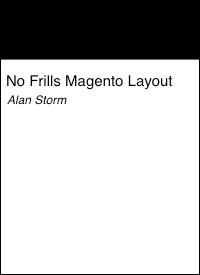 This entry is part 10 of 13 in the series Magento 2 UI Components. Earlier posts include Magento 2: Introducing UI Components, Magento 2: Simplest UI Component, Magento 2: Simplest UI Knockout Component, Magento 2: Simplest XSD Valid UI Component, Magento 2: ES6 Template Literals, Magento 2: uiClass Data Features, Magento 2: UI Component Data Sources, Magento 2: UI Component Retrospective, and Observables, uiElement Objects, and Variable Tracking. Later posts include Magento 2: Remaining uiElement Defaults, Magento 2: Knockout.js Template Primer, and Magento 2 UI Component Code Generation. Today’s we’re going a little off the beaten path — instead of an in-depth tutorial about some esoteric and over-complicated PHP system, we’re going to bundle up some links to Magento Quickies. Magento Quickies is where I post one off, quick thoughts/explanations about some feature in Magento. The posts are less in depth and not always beginner accessible, but still contain valuable information every Magento programmer will eventually need. Between reaching this point in the UI Component series and finally releasing a useful Commerce Bug debugging panel for UI Components/Knockout-Scopes, I decided it was time to tackle Magento’s new checkout application. Trying to customize the checkout application was the perfect test for both our fresh UI Component world view, as well as Commerce Bug’s new KO Scopes debugging features. In diving deeply into the checkout, we also came up hard against more undocumented UI Component features that no one other than a handful of internal Magento core developers really understands (at least until now). Second, we have a set of posts that explore some important integration points in Magento’s checkout application. While not a fully featured tutorial on how to make the checkout do what you want, these posts should save you those day long debugging sessions that are required to trace out where some important action (changing steps, submitting the order, etc) happens. With unlimited time we’d love to write full tutorials on all these topics, but time’s in short supply these days. Hopefully the above will be enough to get you where you need to go.